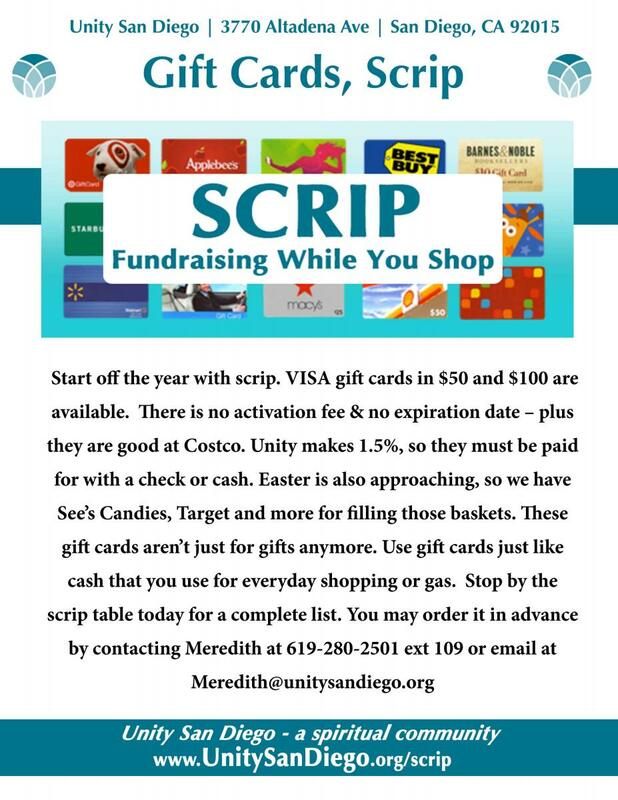 Purchase SCRIP cards (shopping gift cards) & use like cash. Our community benefits from purchases you would make anyway & it won’t cost you extra. A variety of SCRIP cards to gas stations, grocery, department & super stores available. This program raises money for Unity San Diego’s general fund. 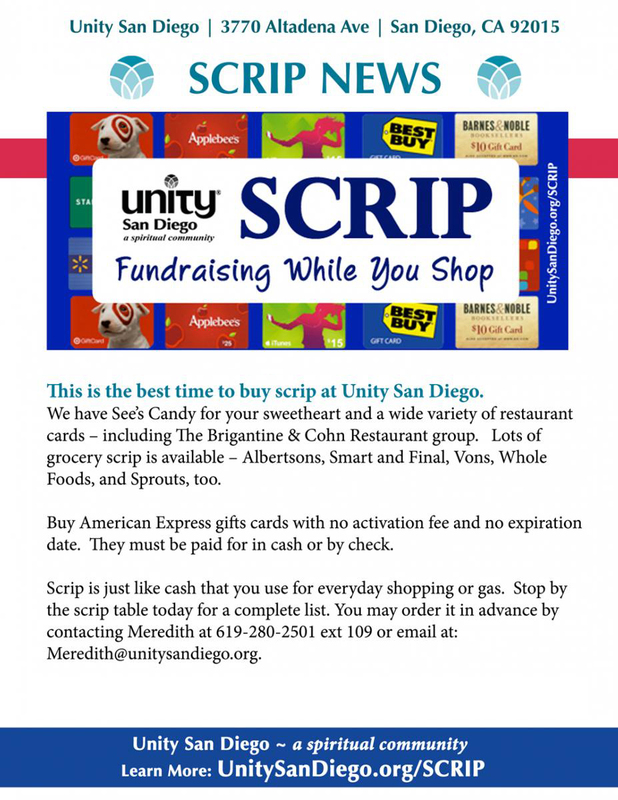 Use scrip for Target, Walmart, Vons or Albertson’s for Halloween needs. We also have Michael's and Joann's for making decorations. If you have a college student, we have Barnes and Noble College Bookstores to be used at UCSD, SDSU and Community colleges. Scrip is just like cash that you use for everyday shopping or gas. Stop by the scrip table today for a complete list. You may order it in advance by contacting Meredith at 619-280-2501 ext 109 or email at Meredith@unitysandiego.org. Your members buy retail gift cards through your scrip program at face value. They choose from nearly 400 national retail stores where they already shop. Click here for a full list. Your organization buys the gift cards at 1-13% less than face value (varies by retailer). Mrs. Smith needs some gardening supplies, so she buys a $100 The Home Depot® gift card for $100 through her son’s school scrip fundraiser. Cha-ching! She just earned $4 for the school because The Home Depot gift cards are available from Great Lakes Scrip Center at 4% less than face value. When Mrs. Smith checks out at The Home Depot, she pays with her The Home Depot gift card instead of using a credit or debit card! She will do the same thing when she needs cleaning supplies at Target®, and earn $2.50 just by using a $100 Target GiftCard to pay for her purchases. Click here for a complete list of scrip available. It is time to re-enroll your Ralphs Reward Card Re-Enrollment Information below. Do it yourself at Ralphs.com or see Meredith at the Scrips Table in Wrigley Hall on Sundays after both services. PARTICIPANT REGISTRATION FOR THE NEW TERM BEGINS ON SEPTEMBER 1, 2015. There is no pre-registration! This means that the first day you can register for the new term is September 1, 2015 or after. All of your members who are currently enrolled in the Ralphs Community Contribution Program will remain active until August 31, 2015. Participants will be required to register or re-register for the new term at www.ralphs.com or by using the scanbar letter at the register starting September 1, 2015. If you received a scanbar letter last year, it is still good and can be used this year. If you would like to receive a scanbar letter, please respond to this email and one will be mailed to you via US post office or emailed to you upon request. Even if your participants registered as recently as June, July or August 2015, they will be required to register again, on or after September 1, 2015. Your organization does NOT need to re-register, only your participants. This notice does not apply to participants of the Food 4 Less/Foods Co Community Rewards program. After you confirm your online account by clicking on the link in your email, return to www.ralphs.com and click your name (you may have to sign in first).